This is such a cute braid. 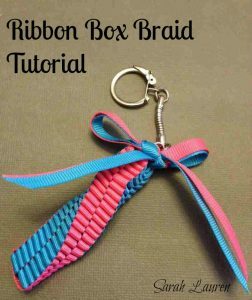 The ribbon box braid bag charm tutorial is great for older children and teens could easily make these with some guidance. I have come across this Box Braid in Hawaiian Lei making. I would dearly love to attend a lesson or two to learn how they make their gorgeous Leis. Kits are available in a range of colours. Buy them here. 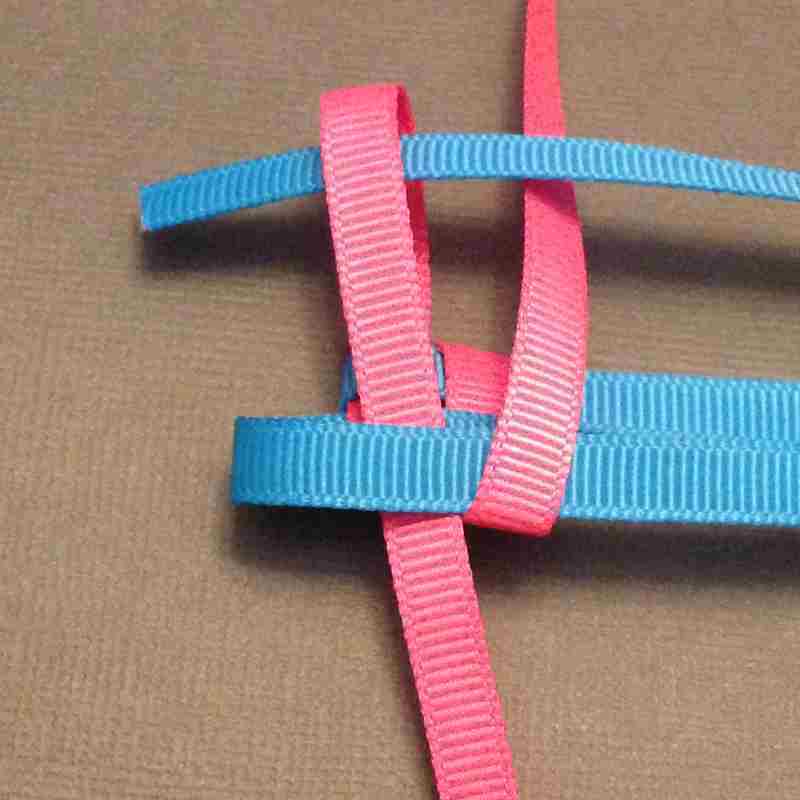 Find the centre of both pieces of ribbon. Using the centre points lay the 2 pieces across each other to form a cross. 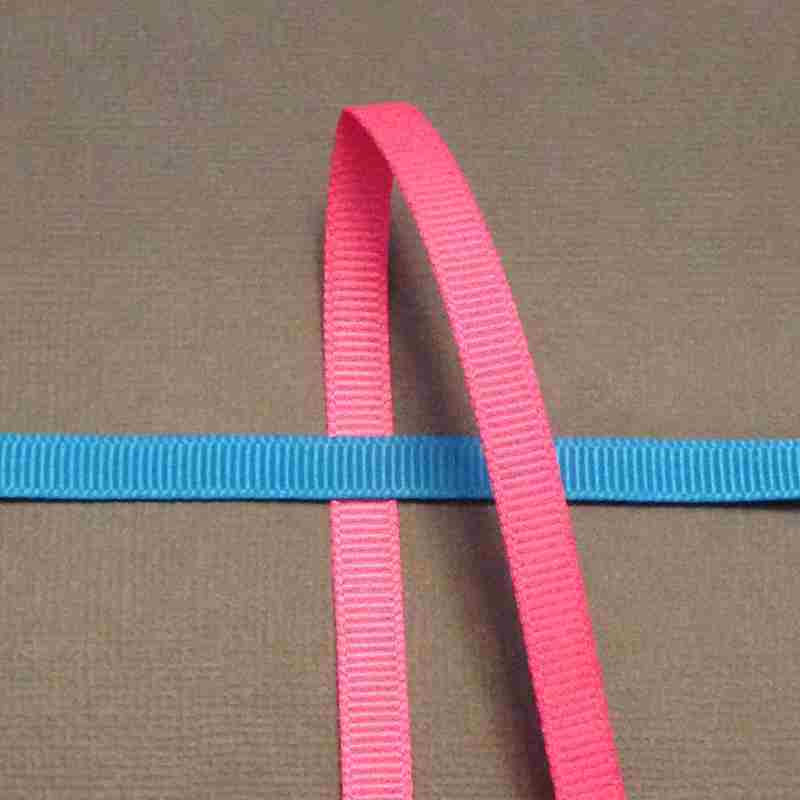 Take the top pink ribbon and fold it towards the bottom. Leave a little bit of space to create a small loop. Take the right blue ribbon fold it to the other side. Now take the bottom pink ribbon (the one that has not moved yet) and fold it towards the top. 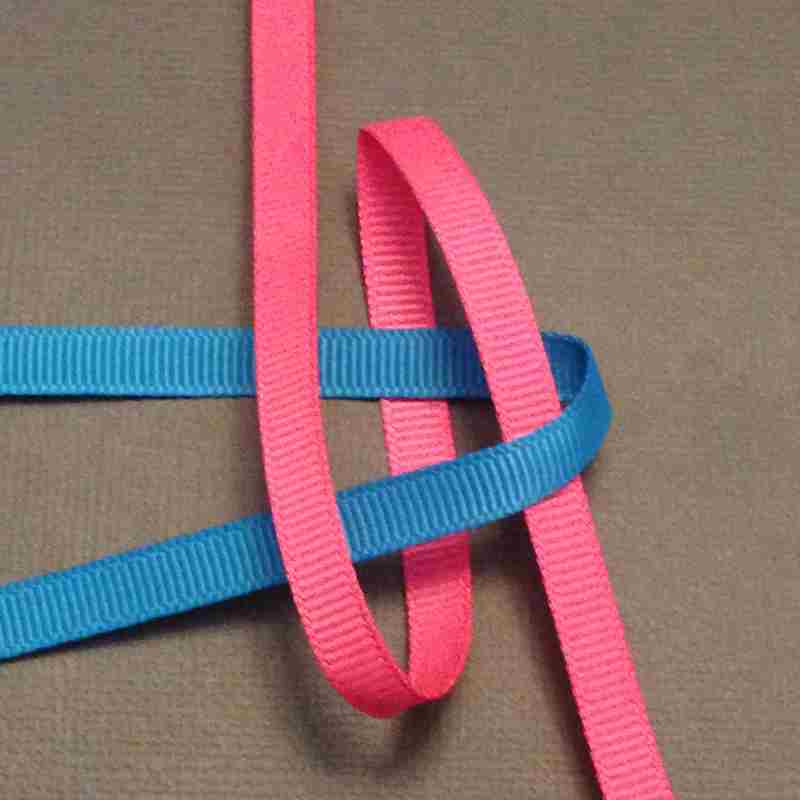 Take the left blue ribbon (the one that has not moved yet) and fold it over the second pink ribbon and pass it through the first loop you created with pink ribbon. Gently pull the blue ribbon through so there is a little bit of slack left. Now slowly pull the each of the ribbons a little at a time until they all come together and form a square. Making sure that all the ribbons are pulled tightly but not so tight as to buckle the ribbon. You have created the beginning of a box braid. These next steps you will continue repeating until you have approximately 7cm of box braid. 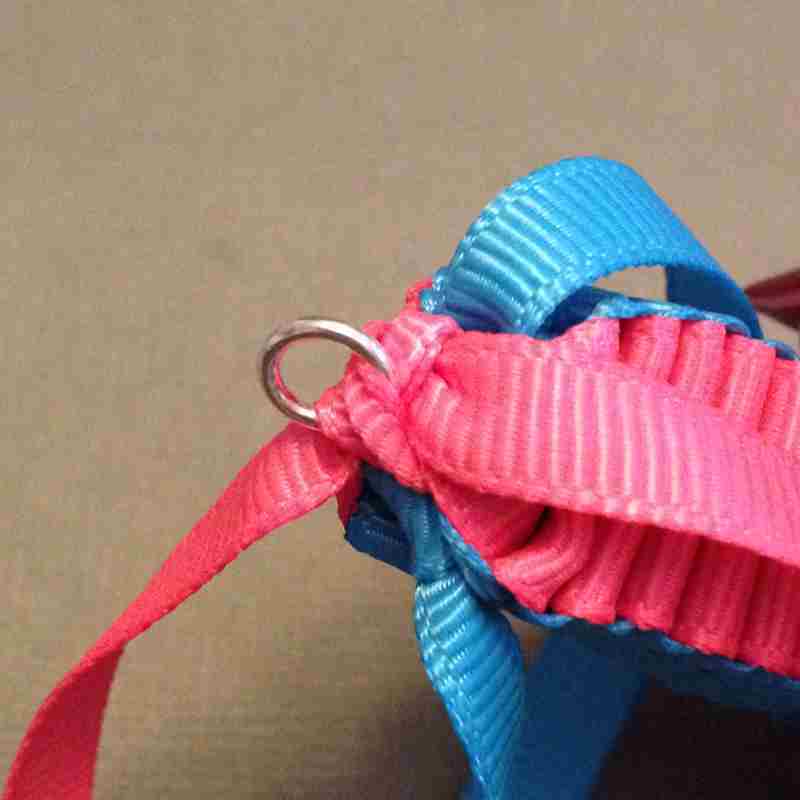 Take the top pink ribbon and fold it towards the bottom creating a loop. 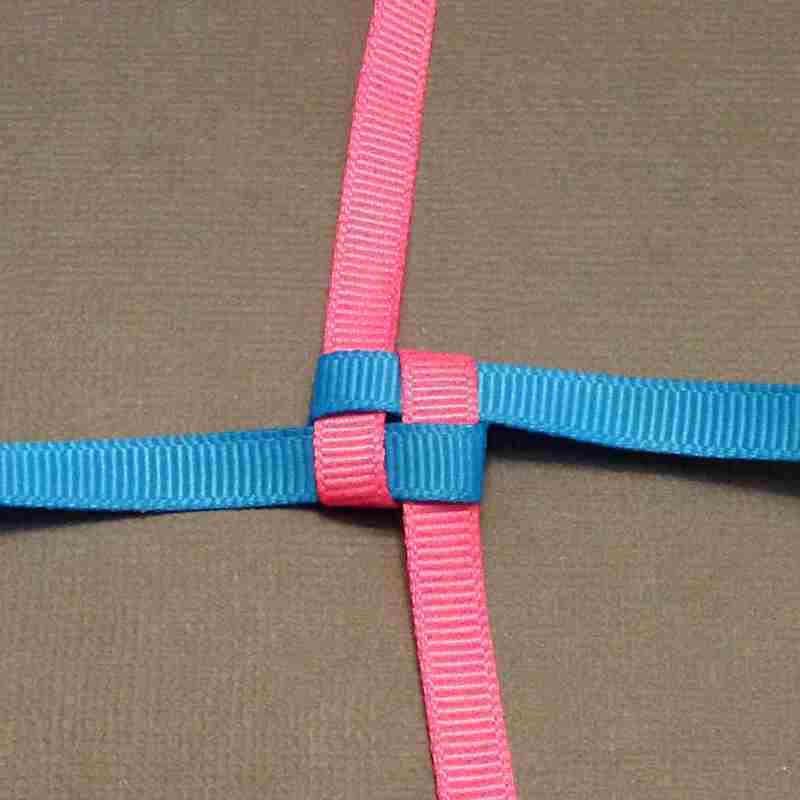 Take the left blue ribbon and fold it towards the right hand side. 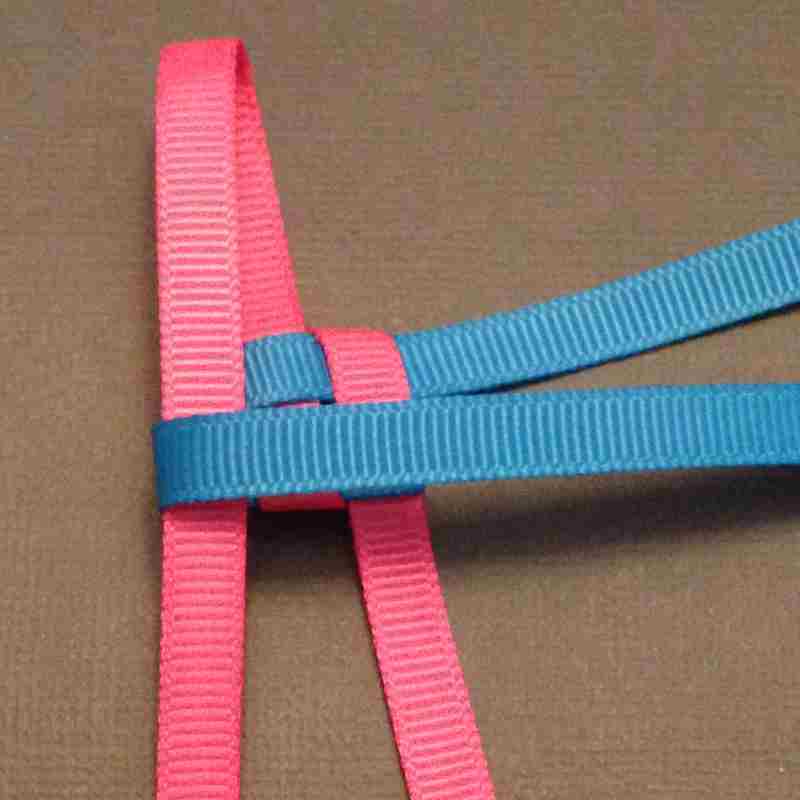 Move the bottom pink ribbon and fold it towards the top. 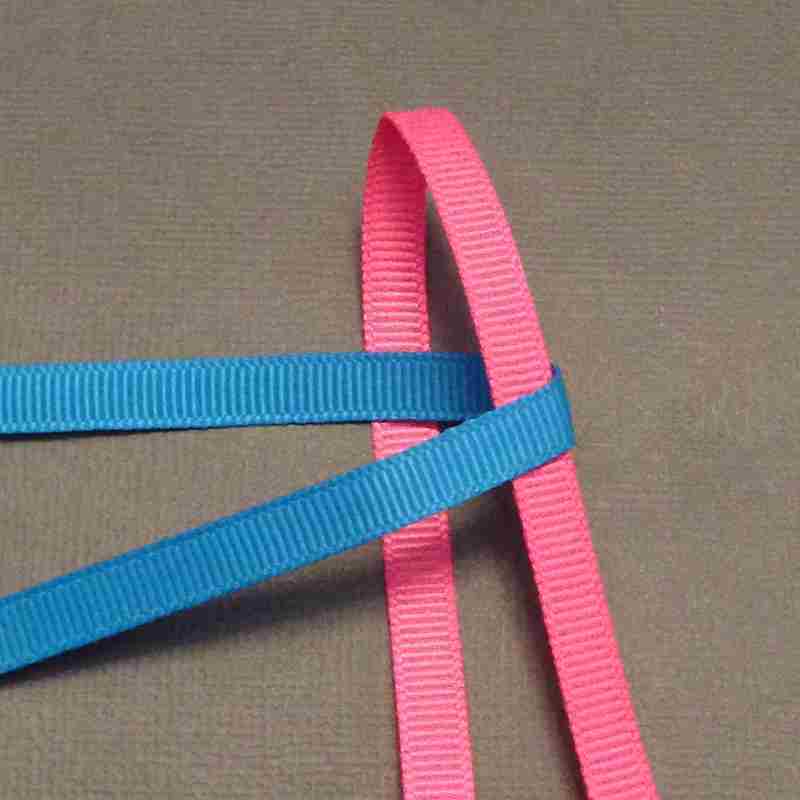 Take the right blue ribbon and fold it over placing the end of the ribbon through the original loop you created with the pink ribbon. Pull all ribbons gently until the box braid forms. 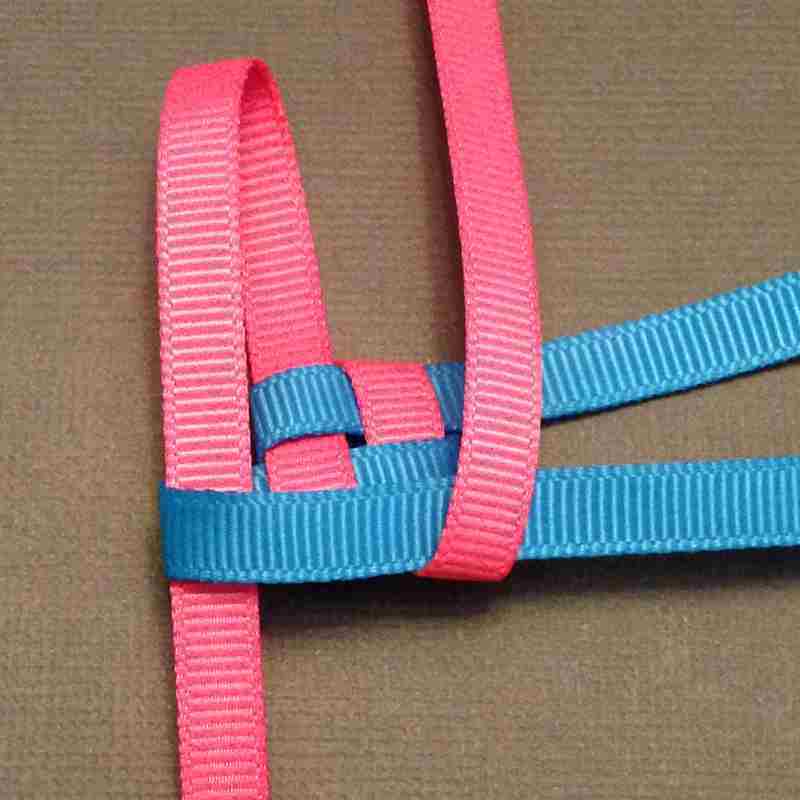 When you do the next stitch you will still loop the top pink ribbon but you will take the right hand blue ribbon. You are swapping sides as you braid. Once you have approximately 7cm of braid tie the blue ribbons together twice. And then tie the pink ribbons once. 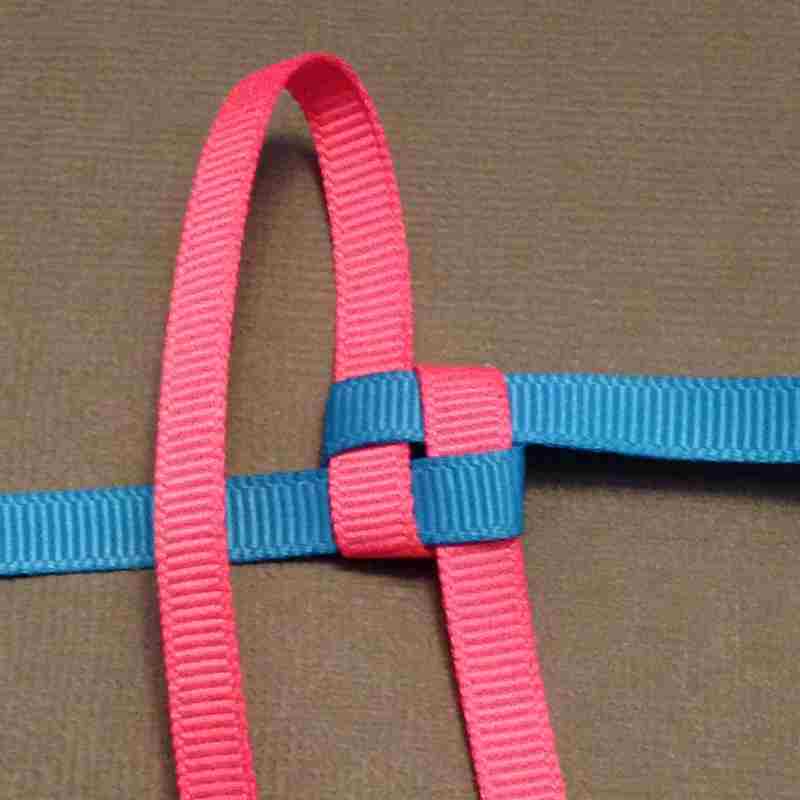 Slide on the closed jump ring and finally tie another knot. Use a little bit of glue to secure the knots. 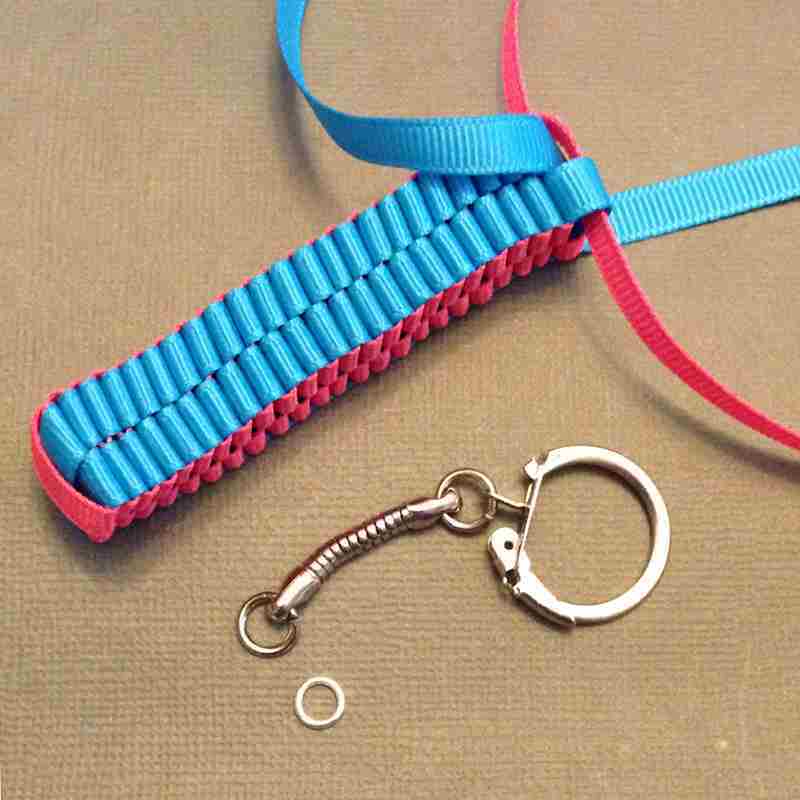 Open the jump ring on the key chain and attach it to the closed jump ring that you tied to the box braid. 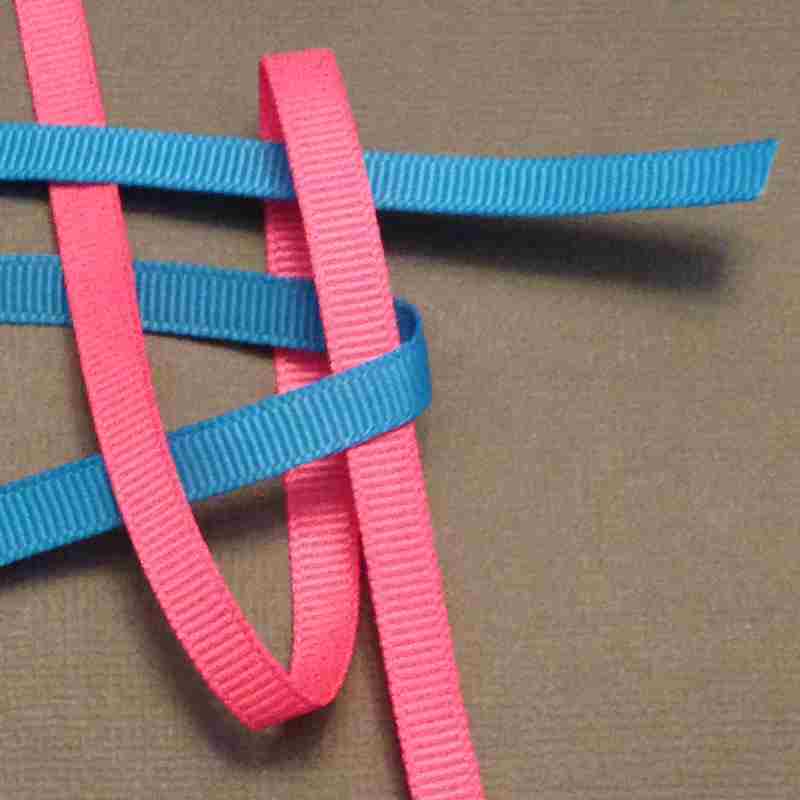 Divide the ribbons into 2 (either one of each colour or the same colours together and tie a bow. 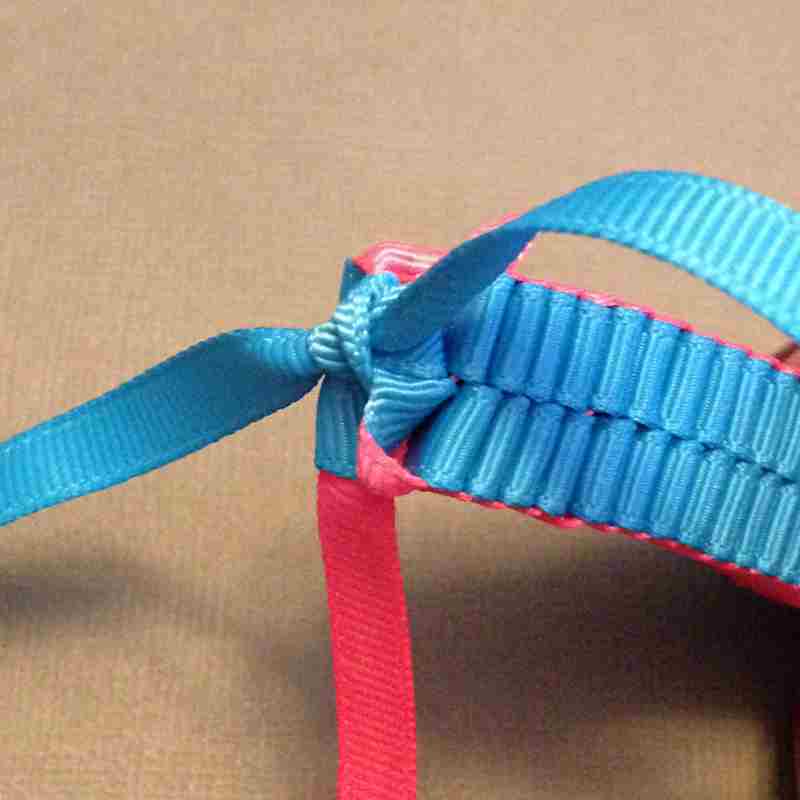 At the end of this tutorial you will find a tutorial on how to tie a bow and have the two ends facing down. If you decide to do this bow make sure the box braid is facing away from you. Otherwise the bow will be upside down. 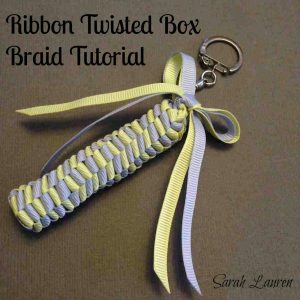 You can leave it straight or give the ribbon box braid a twist. The twist will generally stay in. You may want to spray it with a bit of hair spray to help keep it that way. This entry was posted in General, Tutorials and tagged Bag charm, free bow tutorials, free instructions, Free tutorial, Free tutorials, mini lei, online craft supplies, Ribbon, ribbon supplier.